Splitt, a recently launched cloud server cryptocurrency mining service, is now making crypto mining user-friendly and safe like never before. Available currently in fifteen cities around the world, Splitt’s Cryptocurrency Cloud Server is steadily gaining popularity amongst the amateurs as well as experts looking to mine cryptocurrencies on a larger scale. 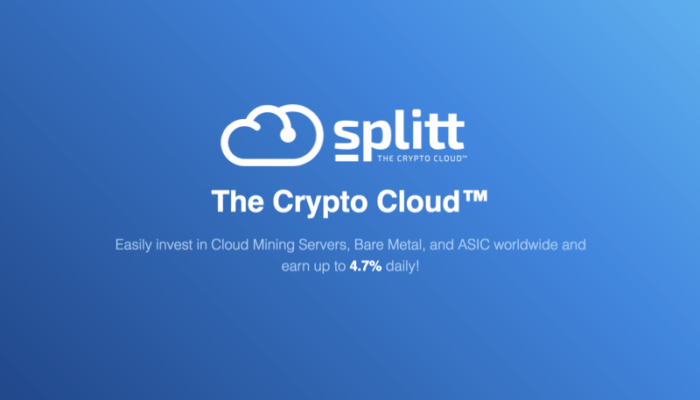 August 7, 2018: The global crypto mining space is currently abuzz with the launch of a new cloud server cryptocurrency mining service named Splitt. Developed taking the future of cryptocurrency mining into account, this service introduces an all new approach to carry out cryptocurrency mining at home without any hassles whatsoever. With its highly sophisticated Cryptocurrency Cloud Server, Splitt prioritizes on offering a standardized, high-performance cloud computing environment in all fifteen cities they are serving at present. Over the last decade or so, Bitcoin mining has become extremely popular amongst the crypto enthusiasts around the world. The process involves solving complex mathematical calculations via computers to receive a block in the blockchain and Bitcoins. However, due to the recent increase in the number of miners, Bitcoin mining has become extremely competitive. Responding to this situation, the Bitcoin network has increased the difficulty level of their puzzles. The changing landscape of bitcoin mining demands optimized mining techniques to ensure profitability. Splitt offers mining services with ASIC integrated chips that are faster compared to GPU and CPU mining, and consume less power. Their cloud mining service requires no hardware, and utilizes shared processing power from data centers. Unlike the traditional mining techniques that require constant maintenance, Splitt makes mining cost-effective, more efficient and flexible for the miners. Better Pricing: Users need not wait for their equipment or deal with issues such as pool fees and system crashes. Hash power once purchased is retained for the entire duration of the contract. Transparency and Service Delivery: Splitt follows the highest level of transparency and ethical standards, and discloses everything to the public. The company is easy to locate and their staffs regularly attend a number of events. Mining Different Coins Simultaneously: Users can mine different coins with their purchased hash power. Allocation of hash power between the coins is completely flexible and simple to choose. Bonus System: Depending on the turnover of their first line, users are offered bonuses up to 10 BTC. In order to enhance the user experience of their customers, Splitt has recently launched their mobile application that can be downloaded from Google Play. This useful Android app allows the Splitt users to continue cryptocurrency mining on the go. Splitt is the result of months of hard work by a twelve member international team led by its CEO Patel Nguyen. A self-made man who has worked his way up from the bottom, Mr. Nguyen is currently one of the most admired experts in the South Asian cryptocurrency fraternity. The company’s CTO Mr. Kim Lee is a Bitcoin mining expert who was actively involved in identifying certain deficiencies in the process that were later addressed with the founding of Splitt.